This post is sponsored by PAMA. Opinions and recipe are my own! 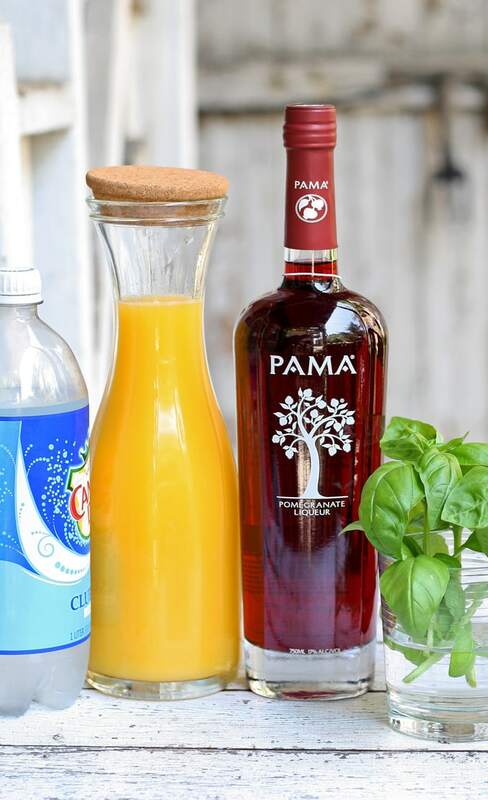 PAMA Sunrise Punch is the perfect party drink! With only 4 ingredients, it is easy to make but so full of flavor that you will want to serve it at every party and brunch you host. If I was hosting a party for my birthday, which is later this month, it would be an all-out daytime extravaganza. I’m thinking brunch meets summer patio party. Food would be served either on a stick or on a small plate – I like to graze. Decorations would be handmade, most likely out of paper. Even though it would be daytime, we would still utilize candles and string lights. Because, well, it’s my party and I’ll light it if I want to. In fact, the below Pinterest board is probably very close to how my party would look. Right down to the delicious drinks. When hosting your own birthday party, keep things simple. Also, make sure that the day is full of things you love. Instead of worrying about pleasing everyone else, just focus on having a good time. Your friends and family will have fun if they know their host is having a great birthday! 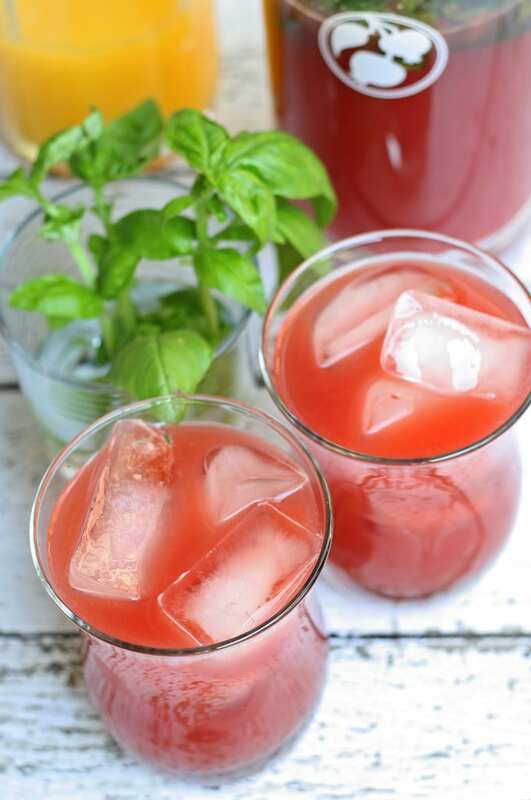 This delicious punch recipe is perfect for my dream summer birthday party. Not only is it easy to make, but it uses some of my garden’s bounty of basil. Also, it can be made in large batches or easily made in individual portions. Then, assemble your drink. 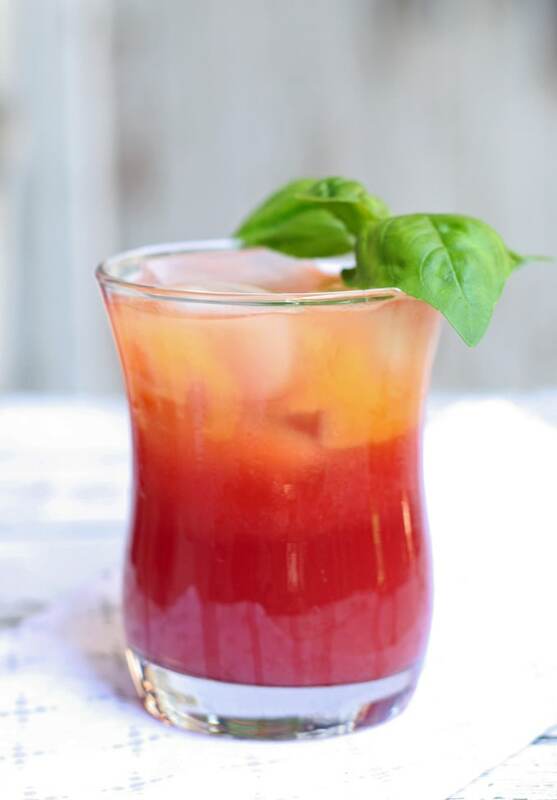 Pour the PAMA on top of the muddle basil, then the orange juice and follow that with the soda water. I don’t like to add ice to the pitcher because I don’t like when my drinks are watered down. Serving this at a party, I would probably keep an ice bucket nearby and fill up glasses with ice as needed. 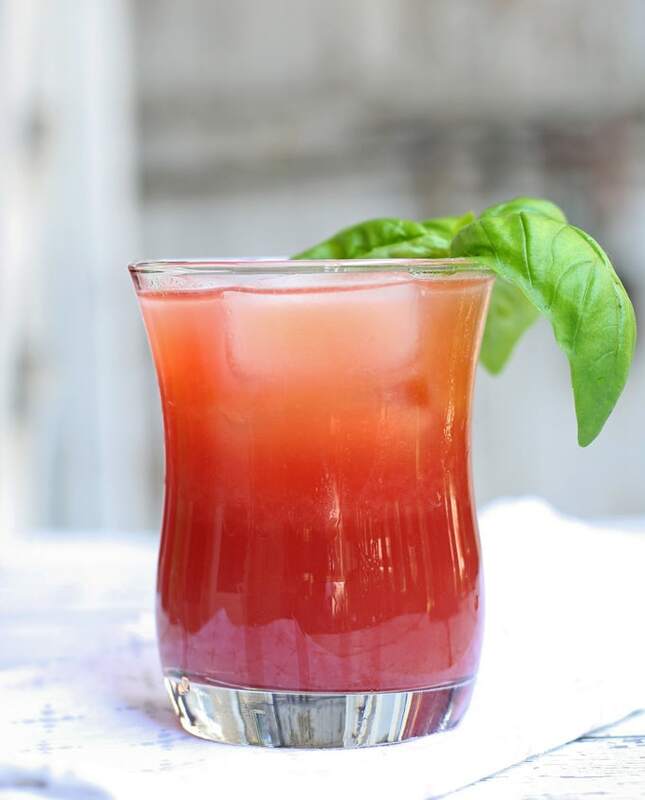 I like to strain my drink so that the basil stays in the pitcher – not necessary but my preference. I also keep a carafe of OJ nearby. Why, you ask? So that I can splash a little orange juice on top to make this drink look just like the sunrise it is named for. 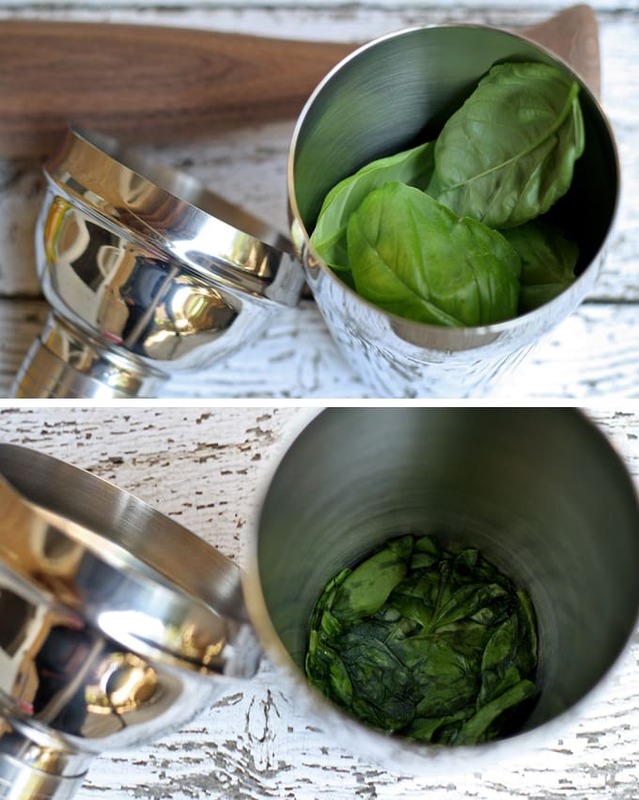 In the bottom of your pitcher, muddle your basil leaves. Then pour the liquid in this order: PAMA, orange juice, club soda. Strain into glasses filled with ice. Garnish with extra basil leaves and a splash of orange juice. 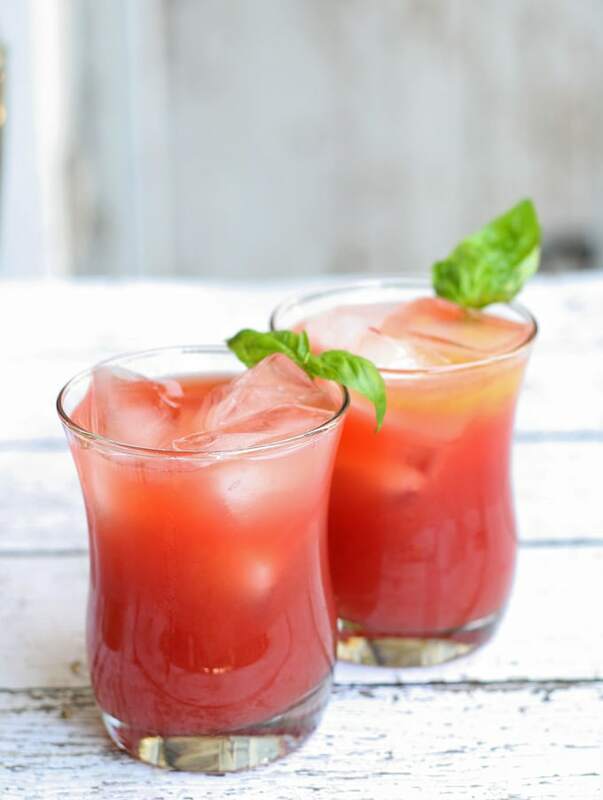 If making individual portions of this drink, muddle 2 basil leaves and 2 parts PAMA, 2 parts orange juice and 1 part club soda. PAMA is running a fantastic summer contest that you should enter today! Winners will receive the chance to make their summer party come to life, with some help from PAMA. There will be one grand prize winner ($500 gift card and PAMA party kit to throw a summer party) and four runners up (each winning $250 gift card and a PAMA party kit to throw a summer party). 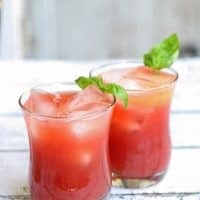 Looking for more fun cocktails? 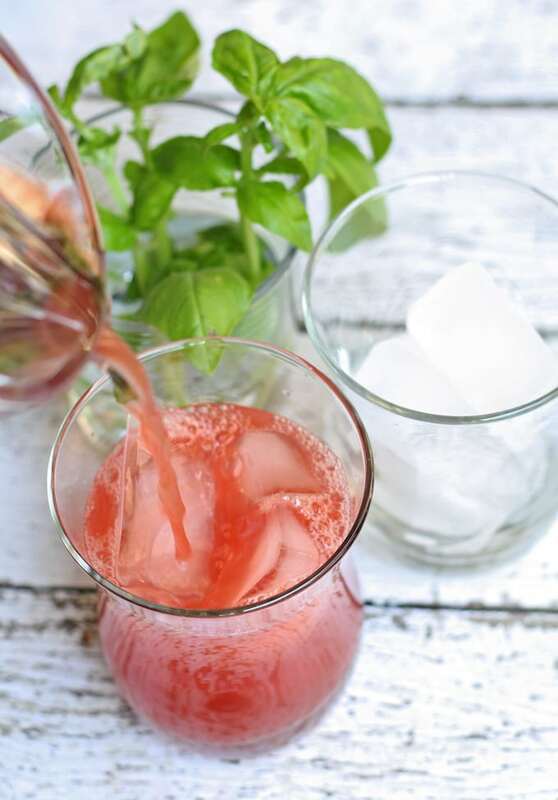 Try this pomegranate, honey and bourbon drink or this lovely raspberry gin fizz! How did I not know that pomegranate liqueur existed??? I’m going on vacation next week & I think this will be the drink of the week!! YUM! 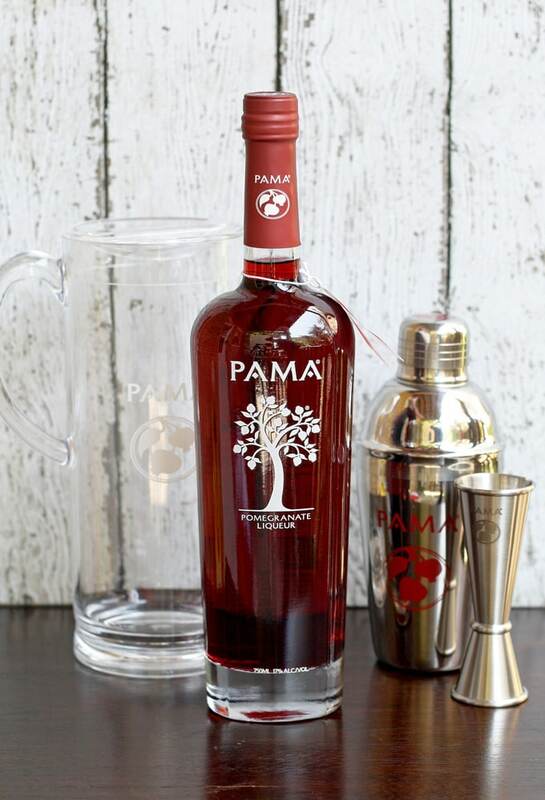 Lol, I’m glad you do now – PAMA bottles are bright red so will be easy to find on the store shelf! Well, I’ve got the basil and the oranges. Just need to pick up the PAMA and soda. Looks lovely, too. Thank you Jean! I hope you like it as much as I do! 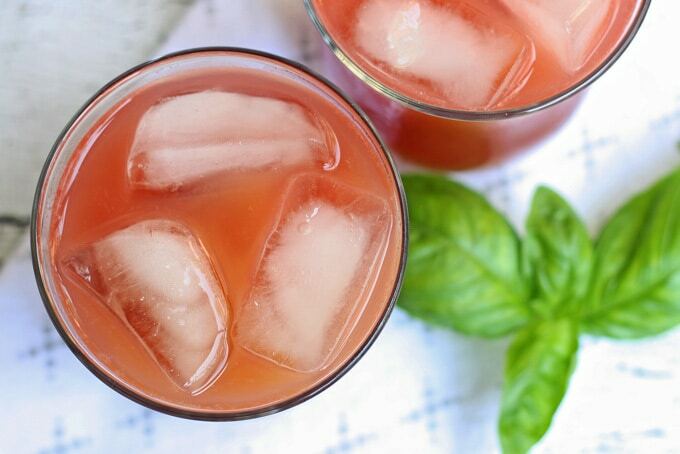 Gorgeous cocktail perfect for summer! Thanks for linking up with What’s Cookin’ Wednesday! 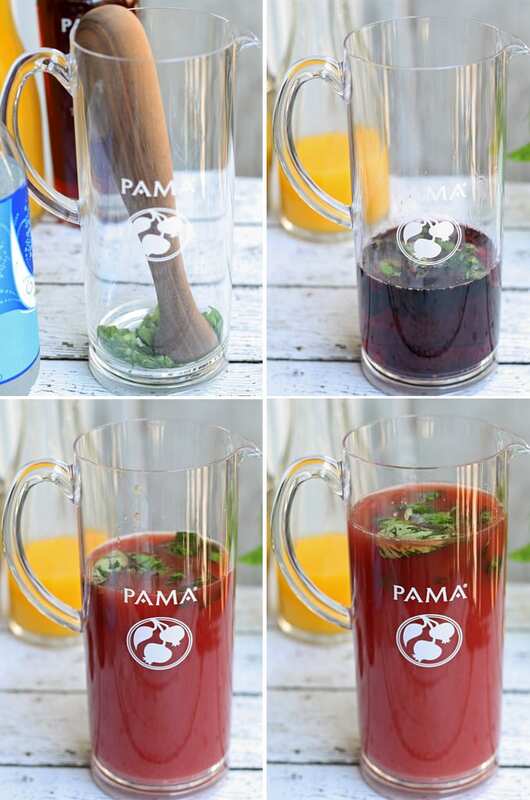 I have to try PAMA! I had no idea pomegranate liquer even existed. I also love the note with the measurements for an individual cocktail. Some night the husband and I just aren’t in the mood for the same thing. Thanks for sharing with #SaucySaturdays! Thank you Christine! The pitcher makes a big batch, and you never know when you will want just one of these babies! I love using liqueurs because they have such an intense flavor. Pomegranate is great because it is tart and sweet at the same time. Plus I like to think that has a ton of health benefits that offset the alcohol that I am consuming. What a great easy drink. One that I can drink quite a few of. The basil adds a nice twist to the flavor profile! Thanks for linking up to #SaucySaturday! This sounds so good! I want to make a pinterest board all about planning my birthday now! I love Pama!! Thanks for sharing on the What’s for Dinner link up and don’t forget to leave a comment at the party – Next week’s features that also leave a comment get pinned and tweeted! Thanks for sharing with us at Family Joy Blog Link Up Party. Hope to see you next week.